Runner uses FLTK 1.3.4 (C) 1996-2017 - Bill Spitzak and others. 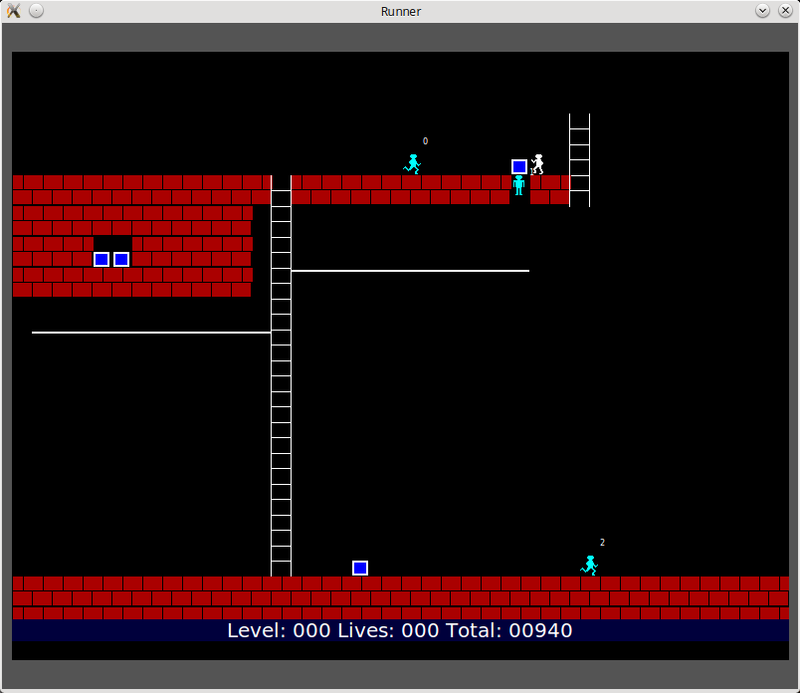 Runner is a run-from-the-bad-guys ("Idgits") and-collect-stuff game modeled after similar games from the early days of computing. A change so the joystick can be enabled or disabled. If a joystick is attached, but the user uses the keyboard instead, the joystick is disabled. It can disabled or enabled from the right click menu. A fix so that idgits do not merge and freeze. A fix so that levels of different sizes display correctly. A fix so that the player stands on ladders at the correct height. Fixes to several levels to make sure an exit ladder appears. A fix so that the player cannot win unless they have collected all the goals. The game is played using either the keyboard or a simple joystick. Your character is white silhouette. The Idgits are cyan. 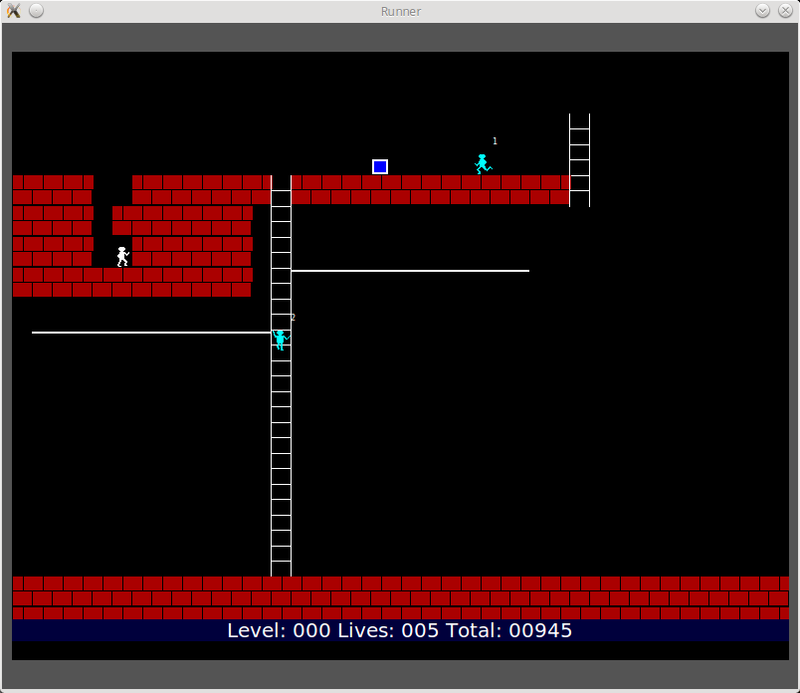 You run around, climb ladders, traverse poles, to collect the blue and white boxes. When you have collected them all, a ladder may appear that allows you to reach the top of the screen, in which case you advance to the next level. If any of the Idgits are able to "touch" you, you repeat the level from the start, using up one of your lives. Unlike the original game, you get an infinite number of lives. Your level and number of lives used is stored in a text file using the "player name" you entered when the game started. To reach some of the goals, you will need to "stomp". You stomp by pressing the space bar or the joystick button. If you are facing right, you will stomp to the right. If you are facing left, you will stomp to the left. You cannot stomp directly under yourself. After a while, a block will reappear where you stomped. If you or any of the Idgits are in the position where the wall block reappears, you or the idgit will die. If you die, the level starts over. If an Idgit dies, they will be revived at the top of the screen. If an Idgit is carrying a goal (they collect them too) when they fall into a hole, they will give up the goal and it will appear above their head. You and the Idgits can run over the head of their fallen comrade. Idgits will not run over your head if you are in a hole. They will "catch" you instead. After an Idgit has been trapped for a while, if nothing impedes their escape, they will receive a small ladder and climb out of the hole. There are several notable differences between my implementation and the original game. The first 200 levels are unique to this implementation. Levels 201 through 350 are estimations of the original 150 levels, based on screenshots and my faulty memory. The "new" levels were created when I built this game for the Amiga many years ago. The new levels are larger than the "classic" levels. The Idgits also use a revised strategy to catch you that has little relationship with the strategy used by the original game. So, while the maps work on a similar principle, different techniques may need to be applied. Once launched, there is a "right click" menu that allows the user to change player, set speed and difficulty, as well as "die" in case the player gets stuck. The game is only partially paused while the menu is appearing. Pressing "escape" will exit the program entirely. The program can be launched providing a user name and level: "runner me 22". If launched with no parameters, it will immediately ask for a user name. That user name will be used to name a file containing your progress. I have not checked if all of the levels are possible. I cannot help you with strategies or techniques. If you find bugs, problems, complaints, please let me know. I can be reached at "laser at hammerve.com". The .zip file also contains a level editor "r_editor". This is a primitive level editor. Invoke with r_editor , where is a level number of a level in the Levels directory. 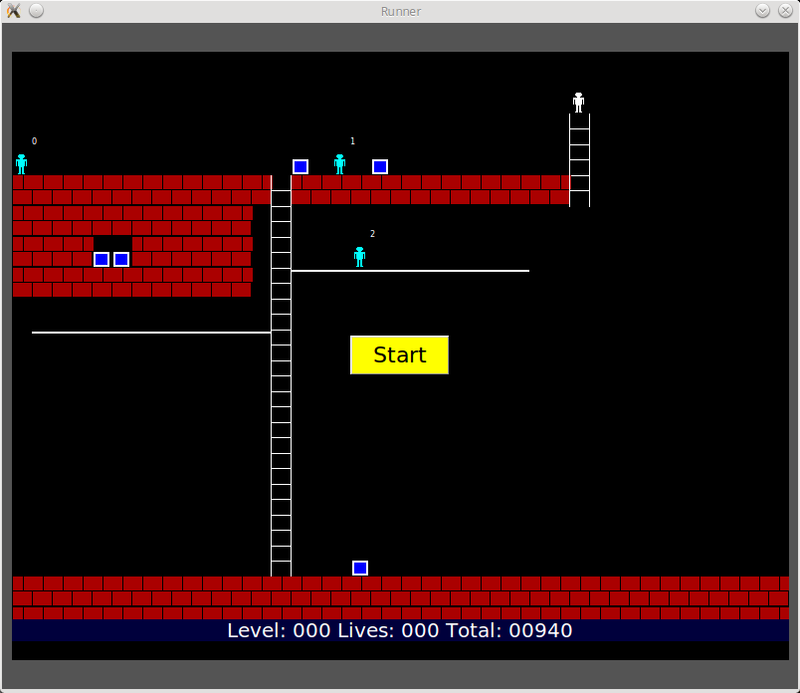 Levels can also be edited using any simple text editor.